Before we dive into one of my favourite wellness topics & remedies to raise my vibration, let’s cover the basics of essential oils real quick! Firstly, what are essential oils? Essential oils are the ‘essence’ or fragrant parts extracted from plants obtained by water or steam distillation or cold pressing. The oils inside a plant are extracted in high concentrations, 100 times more potent than the plant itself. Aromatherapy has been used for centuries as an alternative medicine, it’s safe, and inexpensive. They contain only pure ingredients derived from mineral and botanical sources and do not contain any artificial or synthetic chemicals, preservatives, fragrances or colours that may produce harmful side effects. We ingest different chemicals into our bodies that are either inhaled and enter our bloodstream, or absorbed through the skin. We want to be aware of what we come in contact to and limit harmful chemicals while also increasing exposure to natural substances that will improve our wellbeing. 1. Energy & Mood: Citrus anything! Such a lemon, grapefruit, & lime. And citrus oil has degreasing and astringent properties, as well as skin brightening properties. Citrus oil can help to cleanse, tone, moisturize, and balance your skin’s natural production of oil. (Source) Perfect for people like moi who have combination/oily skin but still want to moisturize using oils and not use a drugstore product. So you’ll get lovely skin, feel happy and energized with this oil combination! Giiiiirl, put down that third cup of coffee and say sayonara to that jittery, heart racing sense of focus. Instead say hellooooo to feeling tapped in, sharp yet relaxed & blissful with peppermint oil! How to use it: I wear this like I would perfume. I dab a bit on my wrists and rub them on my neck, I even put a little dab right below my nose so I can keep smelling it for a little while. I don’t dilute it (most sources say to dilute with a carrier oil if you apply it to the skin, I haven’t had problems but do what’s best for you!) so the scent is strong. People have told me they know when I’m around because they can smell peppermint before they see me. Not the worst way to be recognized in my opinion. Or if you just need a bit, take a slow, long inhale (think a yoga breath) from the bottle (maybe don’t do this in public around people to avoid weird looks lol) or put a drop on your palms and cup around your nose as you inhale. Anxiety be gone! 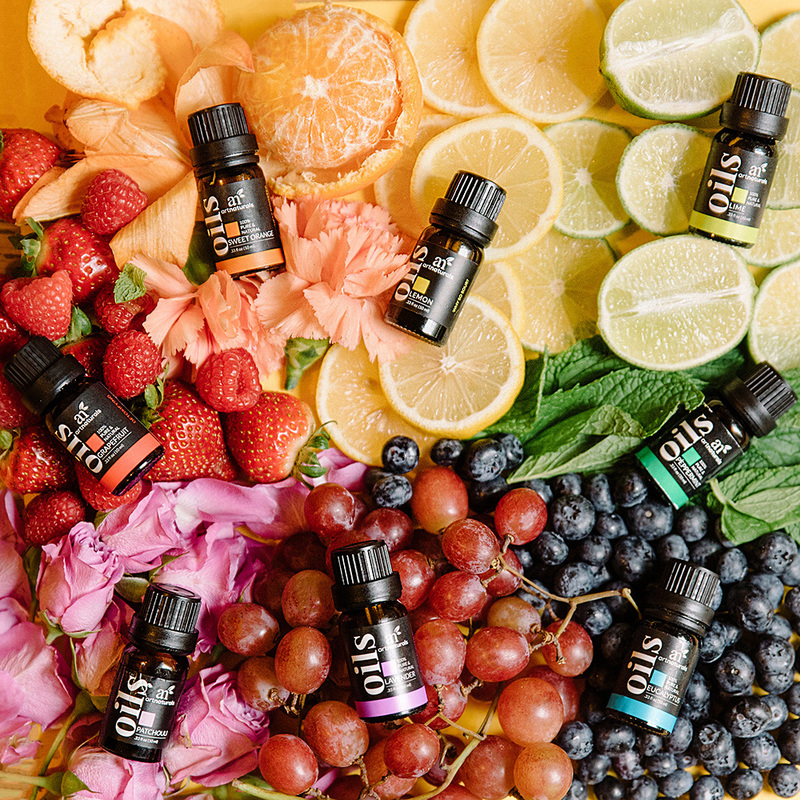 I feel so blissful with this essential oil combination. Lavender is very relaxing and calming and sweet orange makes you happy. The perfect combo if you are having a particularly stressful day and need to chill out! I have a product from Sage called Stress Release and it has lavender and orange essential oil in it as well as a few other floral essential oils. How to use it: I love Stress Release from Sage because it’s premixed and comes in a roll on applicator. So I just roll it across my forehead, behind my ears, along my jawline (anywhere you carry tension) or right below my nose so I can smell it consistently. Peppermint & eucalyptus combined can take you from stuffy and congested to your airways feeling fresh and completely clear, they also relieve headache symptoms. The perfect combo if you are under the weather and are still trying to get work done instead of curl up in bed all day feeling sick. How to use it: You apply it around your hairline like a halo (I avoid the area right beside my eyes because it can tingle and I find that irritating so close to my eyes) also great on the back of my neck, upper back or anywhere that’s sore after a workout. Also a little dab right below my nose or on my chest if I’m feeling congested so I keep breathing it in and it clears my airways right up! In case you want to know the skin benefits too, lavender oil is moisturizing, full of antioxidants that help reverse premature aging, soothes irritated skin and treats acne with it’s antibacterial properties. Again basically magic in a bottle for your skin and sleep routine!